Being on a college board, these books have been recommended for my reading. Carver’s first book came out in 1997 and the second in 2006. 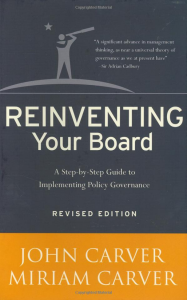 Carver’s unique approach to board make-up is termed “policy governance.” That is, the board exists on behalf of a larger group of persons who “own” the organization (the constituency) and yet they should take moral ownership for its operation. The board makes policy and then lets the policy govern. If the board hires employees, it must not presume to do their work for them. If it has to, it has hired the wrong person. This is interesting for board members of schools and similar organizations. The parallels are not often appropriate for churches.